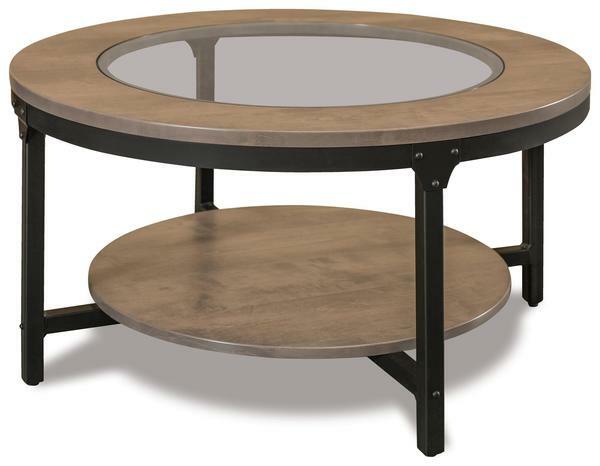 Sister to our Ironwood 38" Round Solid Top Coffee Table with Shelf our Amish Ironwood 38" Round Glass Top Coffee Table with Shelf takes contemporary industrial-style a step further by inserting a round glass to the 1-inch thick top. The glass feature mimics the open wood shelf supported by the steel frame of this occasional table. Shown in brown maple with driftwood finish, customize it by selecting the wood type and finish that suit your home. Shown in Brown Maple with Driftwood stain.